I realize that publications need to have a business model to stay afloat. And the past month has seen a number of online publications (and offline publications) layoff a large number of employees. So it isn’t even clear that all of these hard paywalls, soft paywalls, and advertising based models are going to make the online publishing business work. But the cost of all of this business model exploration and extraction is a continued degradation of the clean and fluid user experience that made the early free and open Internet so compelling. I never got to read what a lifelong public servant’s last words for America were. 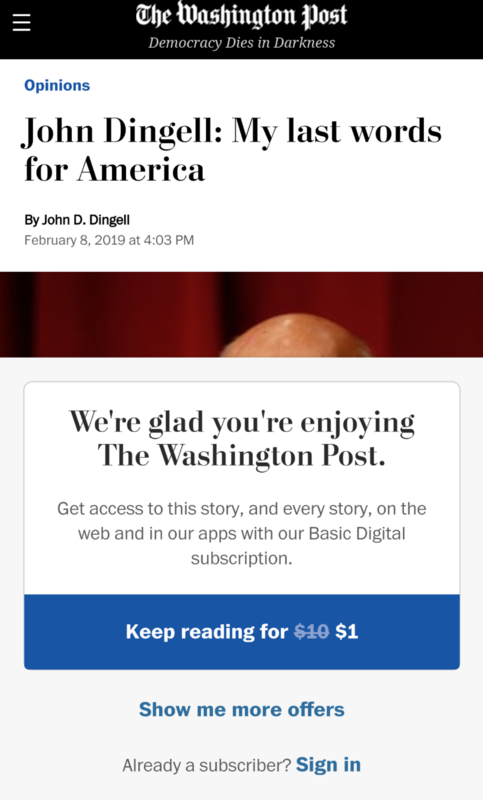 Sure I could have purchased a subscription to the Washington Post, but I don’t believe opinion pieces should be behind a paywall and I certainly don’t believe that something like Dingell’s last words should be behind a paywall. So I’m not going to reward the Washington Post for bad behavior with my money. The truth is Dingell’s family should never have asked the Washington Post to publish his last words. Even the Washington Post’s owner Jeff Bezos knew to publish his words that he wanted everyone to read on an open platform like Medium. The mainstream publications, like Washington Post, have ceded their role as the public square to places like Twitter and Medium that remain open and free. That further limits their relevance. In search of a business model they cede the very thing that made them what they once were. So what is my point? That paywalls are bad? No, I think subscriptions have their place in the publishing business. But the way paywalls are implemented today stinks. Some content should never ever be put behind one. And paywalls should federate, like the early ATMs did, so that joining one means joining them all. That won’t get us all the way back to the free and open Internet that sucked us all in twenty plus years ago, but it will get us a lot closer to it.